Located in the old Dragon Inn resides a Chinese restaurant that is open until 3:00am. So what's the big deal you ask? Since our Friday night hockey games are becoming later and later, these are the only restaurants we can rely on for some eats. Yes, desperate times call for desperate measures. It's getting so bad, I'm considering going back to Knight & Day! Wait, that's just plain lunacy. I take that back. So Milhouse, Dr. No-Share (formerly Dr. 911) and Polka King joined me in exploring the unexplored. Kwan Luck was not even on Urbanspoon. That's how obscure it is. When we entered the place, I was a bit confused at the decor. On one hand, it looked like any other greasy spoon; but then they got these chic Ikea-looking lights in a range of colours hanging over every table. Chinese restaurant? HK- style cafe? Whatever the case, I really didn't care. One look at the menu and it looked more like your regular Chinese restaurant with a few HK-style cafe items. Of course Dr. No-Share decided on a dish all to himself, so we ignored him and got some items to share. It started off a bit weak in that the Wonton Soup was average at best. Consistin g of wontons made solely of pork, we expected some shrimp in them, to no avail. At least the broth was not too bad. Not too salty and a bit of meat flavour (we think it was chicken?). 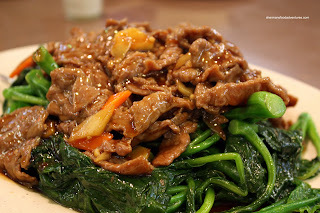 As we were wondering if this was a sign of things to come, the Baby Gai Lan and Beef set us back on tract. It sure looked good and it was. The baby gai lan were tender yet had a nice crunch. The beef was properly tenderized and the entire dish was not seasoned aggressively. What I liked the most was that there was no pool of oil on the bottom of the plate. Being the "banana" (a term to describe an Asian who is white on the inside and yellow on the outside) that he is, Polka King really only knows a few food items in Chinese. 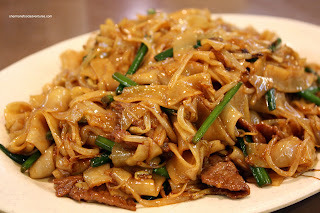 In his broken Cantonese, he wanted his favourite dish "Gon Chow Ngow Hoh" or Fried Rice Noodles with Beef. It seems like that's the only thing he orders... Maybe he doesn't know anything else in Cantonese? When it arrived, the colour was a bit pale (lack of dark soy); but the flavour was pretty good - caramelized soy flavour with chives and tender beef. Again, this wasn't excessively oily (which is usually is) and that was a plus. Now if Polka King only knows one item, Milhouse is not far behind. He didn't need any arm-twisting when the Salted Fish & Chicken Fried Rice was suggested. He seems to eat this exclusively as well. If I only ordered what I knew... say... in German, I'd be eating only schnitzel all the time. I need to teach them some other dishes! Okay, the fried rice was also pretty good. The rice was firm, dry and full of flavour from the salted fish. There was enough "wok hay" (high heat from the wok) to cooked the lettuce without it being soggy. Lost in the food was the Preserved Egg and Salted Pork Congee. It was almost an afterthought. Why? Well, it was pretty average at best. 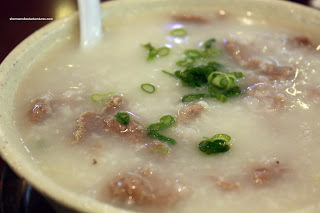 The congee itself was not particularly that thick and there was a real lack of ingredients. I had to search within the congee to find bits of egg and pork. Dr. No-Share had the Beef Congee and it looked a bit better with a decent amount of beef. However, the congee here has nothing on Congee Noodle King or Congee Noodle House. 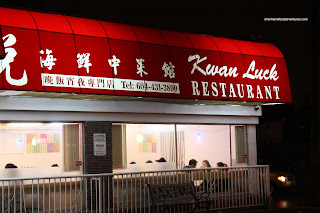 In fact, I would say that Kwan Luck is not the place to go for congee or wontons for all that matter. 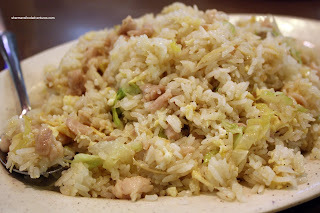 However, the fried rice, noodles and main dishes seem to be executed quite well and at 2:00am in the morning that is a real plus. pork only wonton? that is truly old school....pretty much the last time i had that was in the 80's, pretty much before the asian invasion from HK. nothing wrong with this type....just i think people expect shrimp now. lilfatbuddha, I think you hit the nail on the head. Nothing wrong with that type of wonton... but... yah, it's a shrimp thing now and people expect it. Traditional "wonton" has minced pork filling, and "sui kow" has prawn (whole or minced) filling. 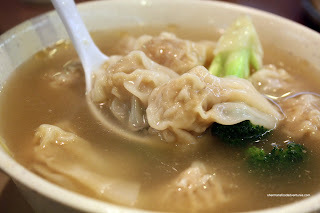 Our prawn wonton" is not as good as "sui kow" in Hong Kong. And I have never had "sui kow" in Vancouver. You know what Enbm? I grew up on pork wontons and frankly they were fine up until the 90's when the new wave of restaurants started using shrimp, then now the trend is towards predominantly shrimp wontons. Thus, I think the good 'ol pork wonton is on it's way out. Unless you eat at a North American Chinese restaurant. In addition, Sui Gow further adds wood ear mushroom and bamboo shoots. I love Sui Gow personally cuz they're so big! Where do you order Sui Gow w/wood ear mushroom and bamboo shoots here in Vancouver? EnbM, actually many of the places I've been too have wood ear mushrooms in their sui gow. Bamboo shoots are much more rare. Just off the top of my head, Tsim Chai and Congee Noodle King both have wood ear mushrooms in their sui gow.